Have you been frustrated with a small electric motor in your home or business that constantly stops running, malfunctions or simply does not work like it used to? 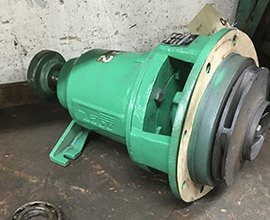 The electric motor specialists at Fixall Electric Motor Service know firsthand that even the best motors only run for so long and eventually, replacement can be your best option. Our electric motor sales team only works with the highest quality brands and advise you on finding the best electric motor based on your needs and budget. When motor repair is no longer an option, or you would like to upgrade to a higher quality, more energy efficient and cost effective model, the electric motor experts at Fixall can help you determine the best motor for your needs. If you need an electric motor or pump for residential purposes, Fixall has a variety of top models and brands to serve you well for years to come. Whether it is your pool pump, ceiling fan, exhaust fan, refrigerator, furnace blower, HVAC, air conditioner pump, electric tools, or any other small motor in your home, Fixall can find the right replacement for your needs. Fixall Electric Motor Service stocks over 5,000 motor and motor-related parts including ball bearings, sleeve bearings, mechanical shaft seals, lip seals, power tool parts, power cords, SinPac motor starters, obsolete / old single phase repulsion induction parts, carbon brushes, definite purpose contactors, electric hoist parts, single phase switch parts, belts and pulleys, fan blades and blower wheels, capacitors, sump-pump controls and motor-cooling fans. We stock several replacement motors for industrial, commercial, residential and HVAC applications including A.O. Smith, Fasco, Leeson and Dayton brands, as well as Barnes, Myers, Sta-Rite and Tsurumi submersible sump and sewage pumps. We also provide Authorized Factory Service for CM Hoists, Milwaukee Hoists, Lincoln Motors, Myers Pumps, Gould Pumps and Zoeller Pumps. We offer top motor and pump brands such as Fasco, U.S., Century, Marathon, Myers, Peabody Barnes, Sta-rite, Teel, ABS, Hydromatic, and Smith and Loveless. For more information about small electric motor replacement from the experts at Fixall Electric Motor Service, please call the shop directly at 616.454.6863.